The Selectmen discussed the Committee's recommendation and voted unanimous approval. According to the MOU, the Herring River Technical Committee (HRTC) was now responsible for developing a Restoration Plan. The Committee began meeting again in February. One of the first orders of business was to establish eleven and eventually 14 sub committees, cataloging issues relevant to the Restoration. In the foreground: Hillary Greenberg, Wellfleet Health and Conservation Agent; Joel Fox, Aquaculturist. In the background are three representatives from the consulting firm of ENSR, who are working with the HRTC. From left to right, Mike Ball, ecologist; Dennis Lowrey, wetlands ecologist; Firooz Pannah, bridge engineer. Eric Derleth and Stephen Spear are HRTC members. Joel Fox; Carl Breivogal, Wellfleet Herring Warden; Stephen Spear, Natural Resources Conservation Service, USDA; Steve Block, NOAA Restoration Center. Eric Derleth, U.S. Fish and Wildlife Service; Tim Smith, MA Coastal Zone Management; Jack Whelan, Chequessett Yacht and Country Club (CYCC is involved in restoration land). In the background are members of the public, who are always invited to attend our meetings. Robert Hubby (vice chair) Wellfleet Open Space Committee; Diane Murphy, Cape Cod Cooperative Extension Service; John Portnoy, Senior Ecologist, Cape Cod National Seashore. Members absent: Gary Palmer, Truro Board of Selectmen; Andy Koch, Wellfleet Shellfish Department. 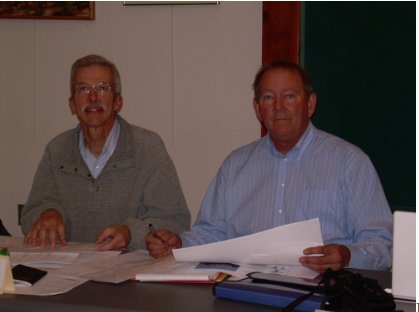 Peter Watts, (chair) Herring River Stakeholders Committee. As of December. 2006, 13 of the HRTC's 14 sub committee's have reported back to the full Committee and 12 final reports have been accepted. These sub com reports contain information that will contribute to the restoration plan. 1. Vegetation Management Issues (approved August, 2006). Study of vegetation volumes, types and locations within the flood plain. Woody stemmed, intrusive upland vegetation will need a careful management plan, for removal prior to being killed by salt water. If the restoration were done in an incremental manner, vegetation could be removed sequentially. Approximately 600 acres of vegetation may require management effort. Various methods and techniques were presented. Options for disposal included: cut and sold as biomass for fuel; cut and burned on site; allowed to naturally transition (in the case of some reedy vegetation). Members: Joel Fox; Stephen Spear; Carl Breivogel; Gordon Peabody. 2. Stakeholder Issues (presented August, 2006). Just over sixty questions were gathered from residents, abutters and the Stakeholders Committee. Questions of a technical nature were answered prior to the early January, 2006 Wellfleet Selectmen's meeting. Questions regarding restoration management were answered as the HRTC began studying planning issues. Members: Robert Hubby; John Riehl. 3. Education Issues (approved August, 2006). The restoration provides a unique opportunity to share "real time" educational material. Teaching and learning concepts, from digital to on site and techniques from newsletters to a "restoration trail" were presented. Members: Robert Hubby; John Portnoy; Gordon Peabody. 4. Migration Issues (approved September, 2006). Multi species, anadromous and catadromous migrations were researched. Critical migration time windows were determined. Members: Andy Koch; Diane Murphy; Carl Breivogel. 5. Budget and Grants (approved October, 2006). Outlines potential budget issues, funding sources and grant timelines. Members: Tim Smith; John Portnoy; Stephen Spear; John Riehl. 6. Permitting Issues (approved October, 2006). Catalogues sequence of overall, multi-tiered permitting matrix, between federal, state and local agencies. Members: Hillary Greenberg; Tim Smith; John Portnoy. 7. Monitoring Issues (approved September, 2006). Provides catalogue of potential bio-indicators, parameters, protocols and sites for monitoring. Members: Diane Murphy, Andy Koch; Carl Breivogel; Gordon Peabody. 8. Restoration Histories, Lessons to be Learned (approved October, 2006). A study of New England's previous salt marsh restorations. Focus was on the nearby Hatches Harbor Restoration which provides a model for elements of our restoration plan. Common restoration problems were described. members: Tim Smith; Stephen Spear; Gordon Peabody. 9. Liaison (approved September, 2006). A catalogue of restoration partners with common interests (ecological, social, educational, administrative, financial and physical) in the restoration process. Members: John Riehl; Gordon Peabody. 10. Archives (approved October, 2006). Catalogue defining documents, electronic and hard copy, to be included in Public Record. Includes protocol for "Management and Disposition of Electronic Mail". Members: Robert Hubby; Gordon Peabody. 11. Outreach (approved October, 2006). Outlines protocol for volunteer program to be conducted through Association for the Preservation of Cape Cod (APCC), to conduct salinity monitoring. Members: John Riehl; John Portnoy. 12. Access (approved October, 2006). Catalogue of issues related to restoration area use, including shell fishing, fishing, boating, hiking and necessary support for such activities. Members: John Riehl; Gordon Peabody. 13. Restoration Impacts (interim report presented October, 2006). On going investigation of property, abutters, structures and road ways, which could be potentially impacted by restoration. Members: Jack Whelan; John Portnoy; Joel Fox; Gordon Peabody. 14. Administration (in process). Developing definitions of membership and responsibility for the future "Over Sight" Committee, which will implement restoration. Members: John Riehl; Robert Hubby; Hillary Greenberg; John Portnoy; Gordon Peabody. Working Groups were appointed, during the fall of 2006, to work on shorter term issues. "Working groups" may include participants outside of the Committee membership when necessary. These groups provide regular reports to and receive direction from, the full Committee. 1. Brochure. The Wellfleet Conservation Trust contributed $2,000 to sponsor an informational brochure describing the restoration effort. MA Coastal Zone Management contributed formatting and layout and MA Corporate Wetlands Partnership contributed $500 to cover additional printing costs. The brochure is currently available on the Outer Cape and by request (at no cost) from gordonsafeharbor@yahoo.com. Members: Tim Smith; John Portnoy; Stephen Spear; Gordon Peabody; Peter Hall, Wellfleet Conservation Trust; Dennis O'Connell, Wellfleet Conservation Trust. 2. Newsletter. The HRTC is creating a semi-monthly newsletter, to continue the outreach information stream initiated by the brochure. Members: John Portnoy; Tim Smith; Stephen Spear; Gordon Peabody. 4. Low Lying Roadways. New Working Group appointed 3/19/07. Reviewing overflight and ground based data from ENSR consultants to determine specific areas of roads within the flood plain, paved and unpaved, which could eventually be impacted by incremental restoration. 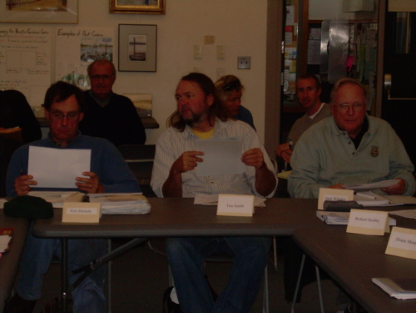 Working Group includes Town of Wellfleet DPW, John Riehl, and others to be named at 4/12/07 HRTC meeting. Town of Truro DPW will also be invited to the April 12 meeting. 5. By Pass Working Group. Newly appointed members will more formally research and act as liaison between the HRTC and Public Safety officials regarding use of a by pass during construction work at the Chequessett Neck dike. High Toss Road is being considered. This could save nearly a million dollars for the restoration project in construction delays and savings if a "by pass" was feasible. This might include widening turns, some grading and brush cutting and locating a water tank somewhere on the West side of the Herring River for fire emergencies. This tank would need to be underground because dike reconstruction would need to occur in winter due to numerous considerations such as human and migratory fish traffic. 5. Second Memorandum of Understanding (MOU II). The restoration of the Herring River needs to be coordinated between Federal (Cape Cod National Seashore or CCNS) and Local (towns of Truro and Wellfleet) entities. These critical, inter-governmental relationships need to be defined in a document referred to as a "memorandum of understanding". This MOU needs to determine the roles and responsibilities of the three entities. Members: Gary Palmer, Truro Board of Selectmen (and HRTC); Rex Peterson, Wellfleet Assistant Town Administrator; John Portnoy, CCNS (and HRTC); Carrie Phillips, CCNS Natural Resources Director; Hillary Greenberg, Town of Wellfleet Health and Conservation (and HRTC); Gordon Peabody HRTC .